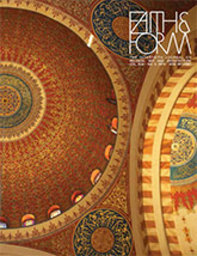 Faith and Form is a journal published four times annually. Its mission is to provide and exchange knowledge, insight, and creativity among those who create and use art and architecture in a religious context. A non-profit organization, Faith & Form is the culmination of nearly 40 years of efforts of many dedicated leaders, volunteers, and staff. Several organizations over time have led to Faith & Form - from the Church Architecture Guild of North America founded in 1940 to the Guild for Church Architecture founded in 1965, to the Interfaith Forum on Religion, Art and Architecture (IFRAA, now part of AIA). Faith & Form represents clergy, lay leaders, artists, architects, and landscape designers concerned with design for worship. It publishes many articles and design ideas of interest to those concerned about the relationship between art and worship. One recent article contained a discussion comparing worship space as an art form itself versus considering it a frame for the art of worship. Located in Washington DC, Faith & Form also sponsors occasional regional discussions on trends in religious designs with other organizations interested in design for worship environments.